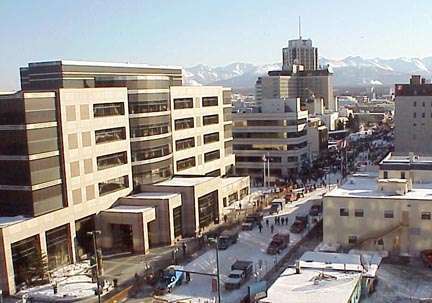 Fourth Avenue in downtown Anchorage is the staging area for the ceremonial start of the Iditarod. The starting area is blocks away in this view looking east. The large building at the left is the new courthouse. 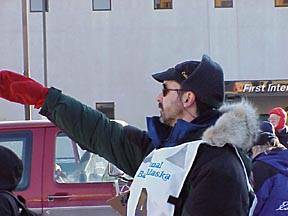 Fifty-six mushers gathered on Fourth Avenue and the side streets around it on Saturday, March 5, for the ceremonial start of the 1999 Iditarod. They would race only 20 miles that day and the results didn't matter. The official start of "The Last Great Race" to Nome would be in Wasilla, a town east of Anchorage, on Sunday. The winner of the 1999 race, Doug Swingley, completed the 1,100-mile journey to Nome on Alaska's northwest coast in 9 days, 14 hours and 31 minutes. The race through the wilderness gave few Alaskans a chance to see the mushers; the Anchorage start, however, provided that opportunity. The biggest crowds were found downtown where they could watch mushers and the dog handlers (such as the woman at the right) make final adjustments as they waited their turn to leave the starting area. 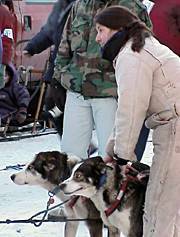 The mushers carried passengers in this first phase of the race. Celebrity riders included Joan Rivers and soap opera star Susan Lucci. A dog handler awaits instructions in the Fourth Avenue staging area. The street is covered with snow that was trucked in before the race. 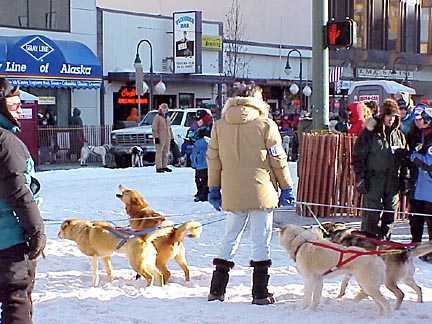 scenes from the start of the 1996 Iditarod.